This cookbook adds the finishing touch to the ideal combination of transportation and living space that only an RVer could appreciate. 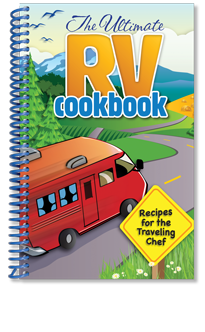 The recipes in this book make it possible for RV cuisine to be appetizing, healthy and convenient. Each chapter provides a short grocery list. From this list, you can prepare and serve 3 days worth of tasty meals on the go. Whether you are new to the road or a seasoned veteran, you’ll discover that this book truly is the ultimate road trip companion!